ABU DHABI, Jan 16 2013 (IPS), Jan 16 2013 (IPS) - Arid countries across the globe are finding themselves high and dry, with not enough groundwater to slake the thirst of both food crops and people. But for coastal states, there is an obvious solution, although it is often energy-intensive. 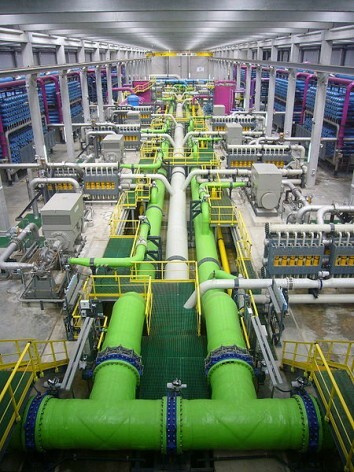 “The only option left for those countries is to desalinate, take the salt out of the ground water or sea water,” says Tony Scowen, business development director of Xylem, a U.S.-based company with desalination plants in the U.S., Middle East and Europe. Xylem’s plants distribute 40 to 190 million litres of water every day. The biggest is located in Dubai’s port town of Jebel Ali, with a daily capacity of over 100 million litres. Xylem uses Reverse Osmosis (RO), a pressure-driven process that separates fresh water from other substances via a semi-permeable membrane. It begins by drawing in sea water from about 100 metres offshore and transporting it to the land-based treatment plant. The water passes through a six-millimetre screen to remove any rubbish and is then lifted by pumps into two sets of filtres that remove sizeable particles. From there, the water goes to holding tanks and is pumped again into the five-micron cartridge filtres, and finally into the very fine RO membranes, which separate out unwanted molecules – including the salt. The end product is then re-mineralised, returned to a holding tank and distributed to the public. The waste water, which is more saline after the process, is pumped back into the sea, away from the inlet. “The main challenge is to ensure that contaminants in the sea don’t get through to contaminate the membranes or get biological build-up on the membrane,” Scowen explains. He adds that the technology is evolving due to the growing popularity of desalinisation, in countries from Saudi Arabia to Spain. But the future expansion of desalination will depend in part of boosting the process’ energy efficiency: an average modern reverse osmosis plant today needs six kilowatt-hours of electricity to desalinate one cubic metre of water.